hats | Lamb on a bike! When I was growing up, I did a lot of exams. School exams – SATs, GCSEs, A-Levels, end of year exams, mock exams – as well as extracurricular exams. When I was 15 I took Grade 8 violin, Grade 8 ballet and Grade 6 piano. A lot of exams! By the time it came to my postgraduate exams, I knew how to revise for essay based exams but faced a new horror: Chinese exams. I was so stressed revising for my final exams, studying endless hanzi that immediately flew out of my memory, and trying to understand grammatical concepts that had only been explained to me in Chinese. Fast forward nearly a decade and I decided to do another Chinese exam. Partly because we’re moving to China and I wanted to have a piece of paper proving that I knew some Chinese, partly because having a set date to revise for would force me to study even if I didn’t feel like it. I signed up online for the HSK level 2 exam at my old university. HSK is an test administered by the Chinese government. It can be taken all around the world and passing different levels allows you to study at Chinese universities or – coming soon – gain points in the new resident permit grading system. Previously there were 11 levels, attainable through three exam papers. The highest level was known to be insanely hard. In 2010 the exam was restructured and now there are six levels, each with their own paper. I was confident that HSK 2 would be achievable, as all the vocabulary would be revision. I downloaded the Anki app on my phone, then the vocab needed, and started working my way through. Anki is an SRS tool – spaced recognition software – where you see flashcards and test yourself on the vocab. If you know the word, great, you’ll see it again in a little while. If you don’t know then you see it a lot sooner. I ploughed through the 600 flashcards needed. Along with revising vocab, I started reading a bit more. I have some graded readers from the Chinese Breeze series, and I read one called “I really want to find her”. It’s impressive that it’s possible to tell a story using only 300 characters but my goodness it’s an inane story. All this didn’t stop me panicking a week before the exam and worrying that I couldn’t write every character on the test perfectly. I downloaded a couple of mock exams and realised that HSK 2 didn’t need any writing at all; it was multiple choice, yes/no or fill in the blank answers. I scored 45/60 and 50/60 in two mock exams, which put my mind at ease a little. It was snowing on the morning of the exam, and I wrapped up warm and headed to SOAS. There were a few people standing outside the exam room, and we all ignored each other. Once in the exam room, our cheery invigilator greeted us and asked if we had 2B pencils to fill in the answer sheet. No one had the correct pencil and he went to fetch us some spares. The answer sheet looked complicated, you had to block out little squares indicating your response, not just for the answers but for your name and candidate number and so on. I could feel myself getting a little stressed but the invigilator was helpful. And then… it began. The first part of the exam is listening. I took a deep breath and tried to stay calm, but I didn’t understand the very first part of the very first question and immediately felt like quitting. More deep breaths and I got to grips with the rest of it. Once the listening part was over I moved on to the reading section. I’m better at reading than listening (I think, anyway) and it was fairly straightforward but also a few slightly unclear questions. I finished with 8 minutes to go (the exam is 50 minutes long) and watched the invigilator looking out of the window at the falling snow. On the way I bought a hot chocolate and downloaded the vocab for HSK 3. Maybe I’m going to get back into doing exams. Early January is a good time to get a few parkruns in, with events taking place on New Year’s Day (with staggered start times meaning you can sometimes manage two!) as well as all the Saturdays. This Saturday could have been my fifth parkrun of 2017 – however it was my first, as I’ve been lazy and ill and demotivated. 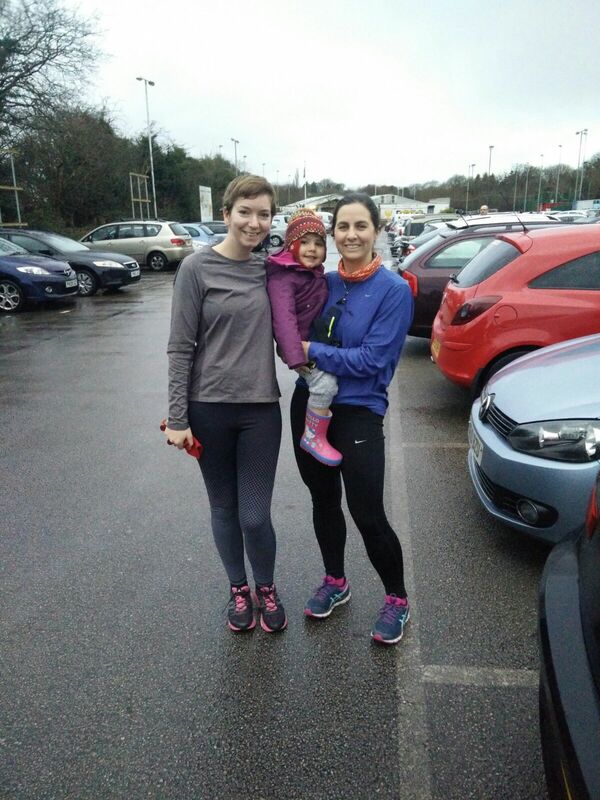 My good friend Maria has recently taken up running again and went to her first parkrun before Christmas. I’d promised that the next time I came to stay, we’d go to parkrun together. So we did! The nearest event is in a park not too far from Maria’s house, where I’ve run a few times on my own. However it’s closed due to work going on in the park, so we had to head quite far out of town (lucky Maria and her husband have a car – big thanks to Joaquin for driving!). We pulled into the carpark of a rugby club. I couldn’t see any signs for a parkrun but followed Maria down the side of a field, to a path along the river. A steady stream of people showed up until eventually there were over 200 runners. The river path was concrete but fairly narrow, and a few people were running two abreast so it was hard to pass. After about 400 metres we took a sharp left onto a muddy path, passing through a field before being funnelled through a narrow path looping back to the start point. This bit was super narrow and almost at walking speed! Then we did that lap again. After the second lap, we took a right along the side of the field towards the carpark, before crossing the carpark and turning left into the woods. I got elbowed by a woman who wanted to overtake but wanted me to move out of her way, rather than her going around me. Up ahead I saw people slowing to a halt and saw a set of stairs! I’ve never done a parkrun with stairs before. The top of the stairs was extremely slippery but there was gravel after that, leading back to the river path. Then we did the first lap again, a third time through the muddy field. The final lap went to the carpark and into the woods again. By this point I was very conscious that I needed the loo! At the top of the stairs I took the long way round to try to avoid the worst of the mud, and then it was nearly done. I rounded the corner into the finishing field and spotted Joaquin and Lucia. It was pretty muddy and I’m really unconfident in mud, so I didn’t sprint for the finish. Maria wasn’t far behind, she was wearing a striking colour combination so we could spot her from a distance, and we gave her a big cheer as she crossed the line. She got a PB, despite the mud and the crowds (Burnage’s biggest ever attendance). Immediately afterwards, it started raining – good timing to miss it! We got our barcodes scanned and then jumped in the car and headed home for cups of tea, toast and showers. I signed up for the Brixton 10k using a discount in the Black Friday sale – one of the few things I bought in the sale. With a cheap entry fee and a nice easy walk to the start line, I thought it would be a good way to kick off the year. Last month I did a 10k in Regent’s Park and felt really crap afterwards as I didn’t do very well. And then I got sick, for what felt like forever. I’m still snotty. It’s really frustrating. The race start was at 9.30, so I planned to leave at 8.45 and stroll over. At 8.30 I told myself I’d jog over at 9am. But by 8.45, I wasn’t dressed and I wasn’t feeling sure. I decided I didn’t want to do it. I didn’t want to go, be slow because I’m still ill and then feel annoyed with myself. I didn’t want to go, be slow and then feel anxious about the next race I did. I didn’t want to go and then have a bad stomach. So even though it felt weird, and wrong, and wasteful, I didn’t go. There will be lots more races, when I feel ready and fitter and healthier. I don’t like to quit things just because I won’t do well… but what’s the point of putting yourself through something that has absolutely no positive effect? The only reason I wanted to still do it was so that I wouldn’t be able to call myself a quitter. But not doing one 10k doesn’t make you a quitter – perhaps I’m a strategic decision maker instead? I went for a run later in the day and my stomach was really bad and I had to lie on the floor for a bit when I got home. Definitely the right call. In 2016 I ran 1,203 km (747 miles), despite spraining my ankle twice and losing all motivation. This year I’d like to run more than that, though I’m not too fussed about the actual distance. To kick it off, I’m going to run every day in January, like I did last year. I didn’t improve on any of my PBs in 2016, so they’re still as follows: 5k 25:52, 10k 57:01, half marathon 2:05:13, marathon 5:08:00. I’d like to improve on at least one of these. I get paid to work 9-5, yet I’m frequently in the office at 7pm. It’s not good for me, and makes me more stressed as I keep piling work up on myself. I’ve only got 8 full weeks left at work, and I’m going to try to keep to 9-5.30 (being realistic – I’m never going to be able to leave at 5 as although working late is discouraged out loud, culturally, it’s very difficult to leave on time). Once I start my new job in China, I’m going to try to keep to my hours, though I hear that can be difficult as teachers are often pressured to work longer hours than they get paid for. I’m doing HSK2 next month and by the end of the year would like to have done HSK3 as well as improving my spoken Chinese, and confidence using it. Don’t be so hard on myself! It’s been mentioned by a few people that maybe I’m a little hard on myself. So I’m going to try to be a bit nicer to myself, maybe like myself a bit more. I’m not really sure how to do this without sacrificing standards, but I’ll give it a go. At the beginning of my second year at university, I got an email from the department administrator saying that all History students should be able to speak other languages and they would therefore pay for us to take courses at the Language Centre. I decided to take Chinese, as I’d enjoyed reading about Chinese history in my first year, and fancied something different to the French and German I already spoke. My Chinese teacher was an older lady from Taiwan, who insisted that we wrote characters beautifully and didn’t like us making jokes. In third year I carried on with Chinese, with a different teacher, although he was also from Taiwan. I even wrote a poem in Chinese! By the time I went back to uni to do my MA a year later, I’d forgotten a lot of Chinese and really struggled in my Chinese classes. My teacher was Song Laoshi, and he wore slippers to class and openly laughed at us. He was very keen on grammar and sometimes made borderline racist comments but we loved him. We also had another teacher who we fell out with spectacularly as she wouldn’t explain something to one of my classmates, who didn’t understand but wasn’t just being difficult. I spent many, many hours in the university library copying out characters but I found it really hard. Since graduating from my MA I’ve been to China three times, and have taken a year’s worth of evening classes. I did a language exchange for a year or so too but ended up speaking English a lot. However this year I’m moving to China. I’ve accepted a job at a school in Shanghai, starting in March. I’m panicking a little about my Chinese – I haven’t spoken it in so long! There’s a standardised test run by the Chinese government, which has 6 levels. I am confident with all the vocab in level 1 and know most of level 2. So to focus the mind, I’ve entered the exam for level 2, which I’ll take in February. I have two very useful apps on my phone – Pleco (a dictionary) and AnkiDroid (a tool for memorising information, which I’m using to drill vocab for the exam). I’m reasonably sure that by the time the exam comes round I’ll be fine with all of the vocabulary. Who knows what my Chinese will be like by the end of the year! I’m hopeful that moving to China will be really helpful for my spoken Chinese, which is really poor thanks to spending so much time studying grammar. I’d also like to break some of my bad learning practices, namely my fear of making mistakes. It’s okay to get things wrong (must keep telling myself this…). 2016 got off to a decent start. I did parkrun on the 1st Jan and then ran every day in January, including two more parkruns. I signed up for a marathon in May. In February I ran in Istanbul, did the Cambridge Half Marathon, both with a cold, resulting in a disappointing time in Cambridge. March was full of races! Parkruns, Frank Harmer 10k, Wimbledon Common Half Marathon and Hampton Court Palace Half Marathon. By April, marathon training was well underway. I ran the Lidl Breakfast Run and did long runs at the weekend, including one where I got so cold I had to heat up in the bath and was sick for 24 hours afterwards. On 21st April I tripped while running home from work and sprained my ankle. Limited running after this. I started May with a sprained ankle. It hurt to run but I tried to do the Halstead Marathon anyway and had to quit at 18km. I did parkrun a week later, which was no better. My ankle got a bit better but then I sprained it again. In June I inched my way back into running. In July I did the Richmond Park Half Marathon and the Ashridge Trail Half Marathon, both very very slowly. I also went to Scotland and ran on some islands. I started August with a mini runstreak, and Matt did his first parkrun. I did my second middle distance triathlon. September saw a return to parkrun and a 10k in Battersea Park. I spent a lot of time working. My work-life balance continued to be dreadful in October, limiting my running. And then I went to India for two weeks. November saw a bad stomach, a trip to the Kendal Mountain Festival for a trail race there and a few half hearted commutes. December had a few commutes and a 10k in Regent’s Park. I was so tired the whole time, and then I got sick with the worst flu I’ve had in years, so I couldn’t even run over Christmas at my parents’ house. I ran the Regent’s Park 10k two years ago and have fond memories of going to Yumchaa with my brother afterwards. I remember the race as being uneventful, I plodded around in 58 minutes and was quite pleased with myself. Two years on, I felt nervous. Running is not going well. My legs are perpetually tired and my brain is an insurmountable obstacle in the way of me even getting out for a run a lot of the time. Still, I woke up, got dressed and headed to Regent’s Park on a chilly morning. I couldn’t hear much of what the race organiser was saying at the start, other than that we should all smile for photos at the finish line. There was a man near me wearing a suit in xmas print. He looked like he might be fast, and it’s always humiliating being beaten by someone in fancy dress (see: London Marathon 2014). Then we were off! I set off too fast, not chronically so but I kept having to pull it back. It’s hard at the start when there are so many people. I’d started a tiny bit too far forward so lots of people overtook me. It was a beautiful day, sunny and bright. I’d gone for the footballer look (tshirt with gloves) and was wearing leggings – I normally wear long sleeves and shorts, rather than short sleeves and leggings, so it felt weird. The leggings were new and a bit too big so they slipped down a little but looked jazzy. At the end of the first lap I was feeling more tired than I’d hoped. I trudged around the second lap feeling a bit worn out and my joints felt tired, like I’d been standing up for 10 hours. Halfway round the second lap, I started to get lapped. At the start of the third lap I got some water and sipped it, hoping that would perk me up. I was a bit defeated by this point and when I got to the 8km marker I walked for a minute, rubbing my right hip, which was sore. Again at 9km I walked for a moment, struggling with motivation. I ran past the zoo and only on the final lap did I think to look at the animals. Didn’t see any. I turned onto the final straight and thought about sprinting but it felt embarrassing when I was so slow overall. I crossed the line in 1:00:57. And I didn’t smile for the camera. There was a long queue snaking across the grass and I joined it, waiting for a medal and a can of drink. Behind me was a Hooray Henry, his voice booming out across the park. At least by running my speed I hadn’t had to run near him. And I beat the man in the xmas suit! I didn’t go to Yumchaa afterwards (I felt I didn’t deserve it…) but went to Pret instead and had a mint hot chocolate, so my self-flagellation clearly knows some bounds.